You are browsing the archive for woodcut. At the start of his career, as a young man in his twenties, Albrecht Dürer created a series of woodcuts to illustrate Sebastian Brant’s The Ship of Fools of 1494. Dürer scholar Rangsook Yoon explores the significance of these early pieces and how in their subtlety of allegory they show promise of his masterpieces to come. 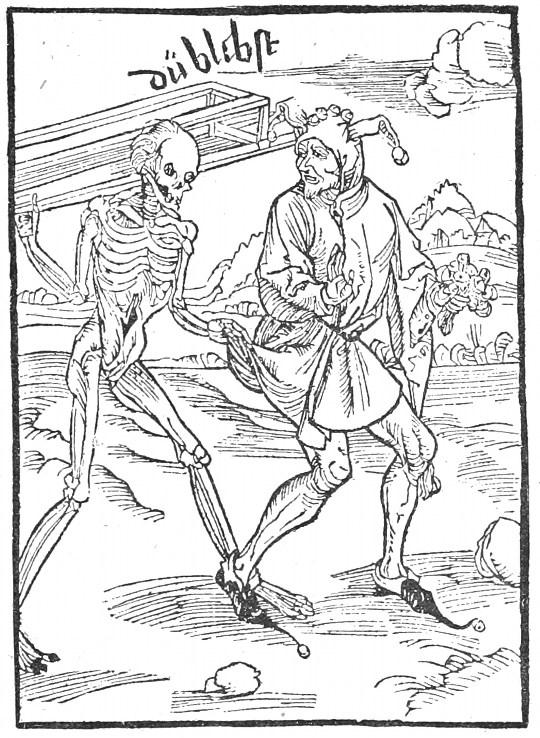 Attributed to Albrecht Dürer, woodcut illustration for Chapter 85, “Not Providing for Death”. The celebrated Nuremberg artist Albrecht Dürer (1471-1528) spent part of his journeyman years, from 1492 to 1494, in Basel, working as a woodcut designer for some of the most eminent publishers of his time, including Johann Bergmann von Olpe, Johannes Amerbach, and Nicolaus Kessler. Basel, along with Strasbourg, Augsburg and Nuremberg, was a prosperous commercial town and a leading artistic and publishing center in the North of the Alps. Dürer’s journeyman experience here was crucial in his formation as a woodcut designer deeply engaged in the early publishing industry. 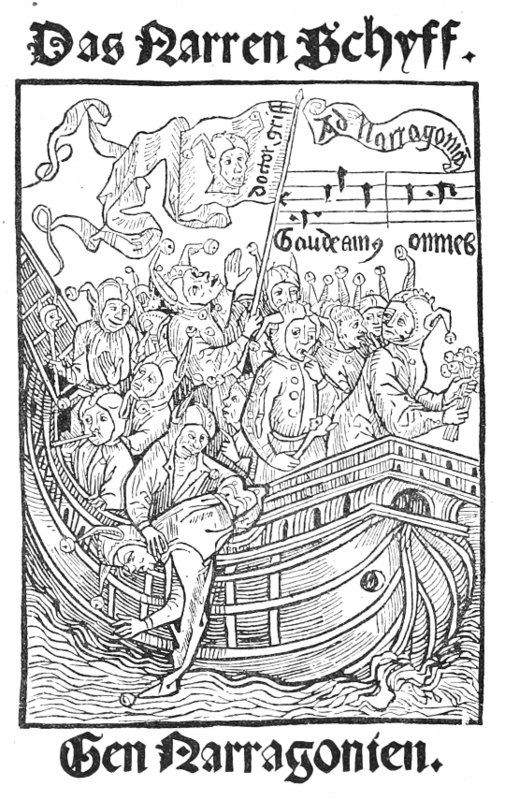 The most important woodcut project that he was involved with during this time was the design of an extensive illustration cycle to accompany The Ship of Fools, the satirical verses composed in German by Sebastian Brant (1457-1521) and published by Bergmann von Olpe in 1494. This collection of moralizing stories was an instant best-seller; so much so that in that same year, five separate pirated editions appeared in Strasbourg, Augsburg, Nuremberg, and Reutingen. No doubt, its numerous whimsical woodcuts depicting various types of foolish and sinful human behavior contributed to its great success, as these illustrations were copied in all subsequent editions until the late sixteenth century. Nowadays, in general, about two-thirds of the 114 illustrations (counting 9 repeating ones) in the 1494 edition are attributed to the young Dürer, while the rest, which are found inferior in design and cutting, are ascribed to anonymous masters, such as the so-called Master of the Haintz Narr (named after the namesake scene in The Ship of Fools). A more conservative view, expressed by the art historian Erwin Panofsky in 1945, attributes only one-third of the illustrations to Dürer. The Master of the Haintz Narr, woodcut illustration for Chapter 5 , “Of Old Fools”. Attributed to Albrecht Dürer, woodcut illustration for Chapter 14, “Of Insolence toward God”. Overall, the woodcuts Dürer made during his journeyman years are not as impressive as those he created later as an independent master in Nuremberg. For example, hatching lines used for modeling consist here only of simple parallel lines, and the contour lines during this early period are depicted crudely and overly thick without much variation. The artist presumably simplified his illustrations so as to accommodate the limited skills of block-cutters (Formschneider) who were in charge of cutting the woodblocks he designed. Nevertheless, Dürer’s woodcuts in The Ship of Fools already reveal seeds of his stylistic elements and motifs found later in his career. They also betray a greater understanding of the book’s narrative and allegorical content, suggesting that he worked closely with Brant, possibly responding directly to the author’s demands and instructions. Dürer’s intimate knowledge of Brant’s text can best be illustrated by examining the original title page designed by the Nuremberg artist, The Fools on a Cart and a Boatload of Fools. Dürer's Fools on a Cart and a Boatload of Fools, the original title page. This woodcut of Dürer’s occupies almost the entire title page and consists of two scenes that are vertically arranged. The upper compartment shows figures in fools’ caps — shaped like donkey’s ears and adorned with bells — riding a cart pulled by horses and being guided by fools. This uppermost register also has the book’s title, “The Ship of Fools” (“Das Narren Schiff”), carved on the same woodblock as the image. In the lower section, three boats of yelling and singing rowdy fools set out for their destination, “The Land of Fools” (“Ad Narragoniam”), as indicated in the caption. Attentive viewers may find it odd that two different allegorical subjects, both the multiple ships of fools and a single cart of fools, are juxtaposed in this original title cut of 1494. It differs greatly from the better-known title cuts of later years, all of which utilize the image of only a large ship of fools, thus visualizing the book’s title verbatim. This seemingly dissonant title cut of 1494, however, confirms that Dürer was indeed well aware of the structure and themes of Brant’s original German text at the time of its conception and original publication. Despite the book’s title, in Brant’s original text, the idea of a ‘ship’ is not central, but rather, incidental. As noteworthy as the ship is, it is only one amongst a number of diverse motifs including a cart, a dance, a wheel of fortune, a net, a mirror, and a bagpipe. The ship motif became the book’s foremost leitmotif only when, while being translated into Latin, Jacob Locher, Brant’s pupil, extensively rearranged and revised Brant’s text to give it a semblance of unity, which was found lacking in Brant’s original. This Latin edition, translated and edited by Locher and first published by Bergmann von Olpe in 1497, became the standard version of The Ship of Fools’ text that was repeatedly copied in all following editions and translations. Given all, at the time of the book’s first publication, Dürer’s title cut, with both the cart and multiple ships, advertise the book’s full content more adequately than its short, unilateral title. It complements the title words in communicating the book’s complex, multi-structural narrative elements to the reading public, and further, it mirrors the general structure of the book. The Ship of Fools, which consists of 112 chapters, is roughly dividable into two parts. In contrast to the first half of the book (that is, the first 61 chapters), where the metaphor of a ship plays a small role except in chapter 48 (“A Journeyman’s Ship”), the ship motif is disproportionately greater in the second half: the prologue (since it was written last) and chapters 103 (“Of the Antichrist”), 91 (“Of Prattling in Church”), 108 (“The Schluraffen Ship”), and 109 (“ Contempt of Misfortune”). We gather that Brant gradually realized its symbolic importance in the process of his writing. The significance of the ship in the second part is even more apparent when one examines the text illustrations. Even when the ship is only briefly mentioned, or even not mentioned at all, it is still visually depicted, sometimes as a tiny object floating on a lake (or a sea) in the background, and sometimes far more conspicuously. This can bee seen in chapters 68 (“Not Taking a Joke”), 72 (“Of Coarse Fools”), 75 (“Of Bad Marksmen”), 80 (“Foolish News”), and 81 (“Of Cooks and Waiters”). 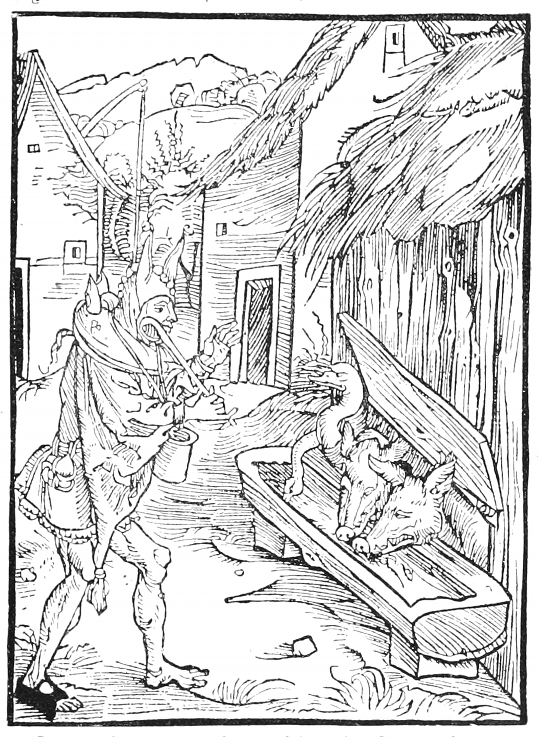 Attributed to Albrecht Dürer, woodcut illustration for chapter 103 , “Of the Antichrist”. 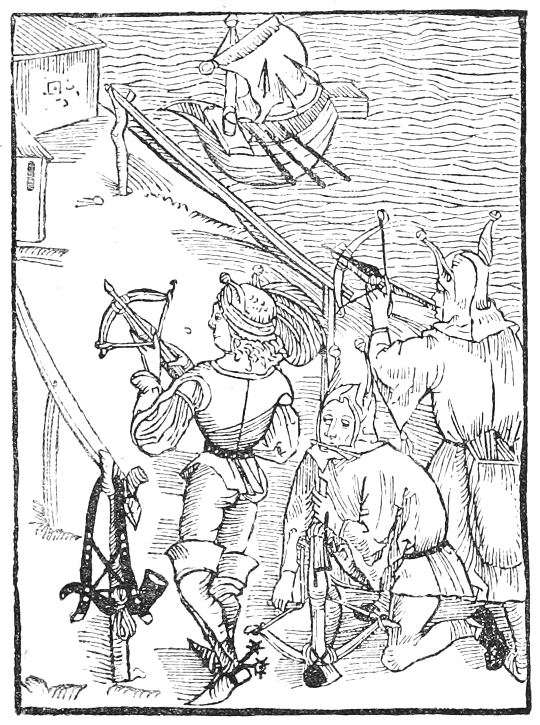 Attributed to Albrecht Dürer, woodcut illustration for chapter 75, “Of Bad Marksmen”. The motif of a cart of fools is treated as a principal theme only twice in the book, once in chapter 47 (“On the Road of Salvation”) and another time in chapter 91 (“Of Prattling in Church”), where both the cart and the ship are addressed simultaneously. Less emphatically, the cart motif is mentioned once again in chapter 53 (“Of Envy and Hatred”). However, Dürer’s depiction of the cart, along with ships, on the title page serve well as metaphors for land- and sea-going vehicles carrying the fools, thus conveying the universality of all the fools described by the text. With the editorial changes made to Brant’s text by Locher, who utilized ‘the ship of fools’ as the leitmotif throughout, not only in the first Latin edition of 1497 but also in all subsequent publications (both authorized and pirated), the book no longer reproduced or imitated the original title page design by Dürer. 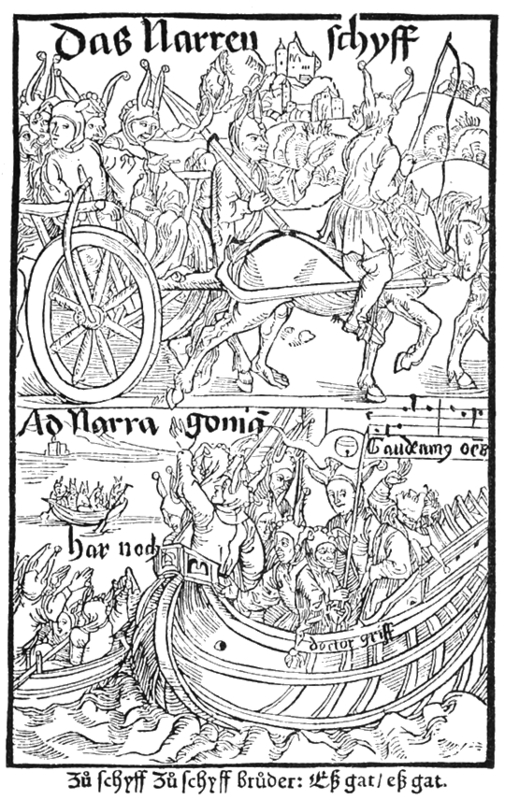 Instead, after 1497, a different woodcut, rendering only a large ship laden with fools and attributed to the Master of the Haintz Narr, repeatedly served as the title cut prototype. 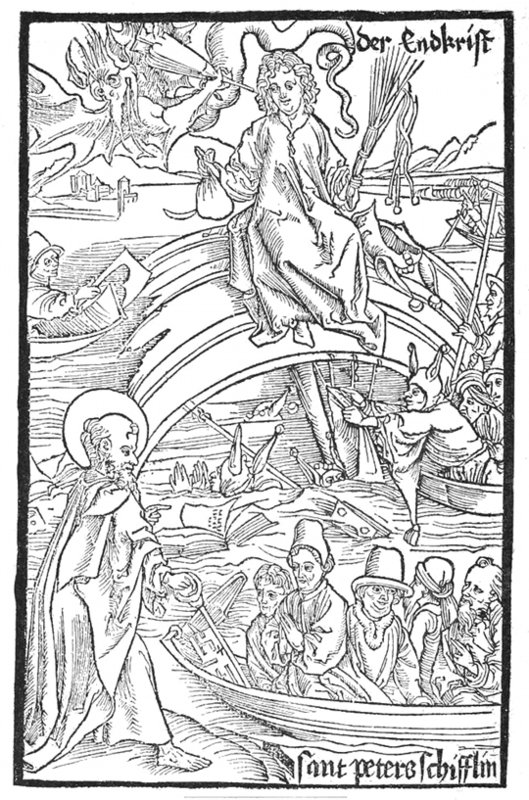 In 1494, the Master of the Haintz Narr’s woodcut originally appeared as the frontispiece on the verso of the title page, and also can be found as an illustration accompanying chapter 108, “The Schluraffen Ship.” As the concept of the ship became the most significant motif of the book, this woodcut became the most fitting image for the title cut, as it visualizes the two principal ideas of the book and its title — namely, both a ship and fools. However, it is Dürer’s original title cut for the 1494 edition which represents the book’s original structure and thematic concerns much more faithfully and allegorically. Master of Haintz Narr, the frontispiece of the 1494 edition which became a popular choice for title page in later editions. Throughout his career as a successful independent master in Nuremberg, Dürer continued to create woodcuts that were meant to accompany texts. He provided numerous humanist friends and Nuremberg publishers with woodcuts to illustrate their new publications. Best known works, of course, are his own illustrated books, such as the Apocalypse (1498; the second edition in 1511), the Large Passion (1511), the Life of the Virgin Mary (1511), and the Small Passion (1511). Here, the primary features are the woodcuts themselves, rather than texts, and significantly, he self-published them by hiring printers. 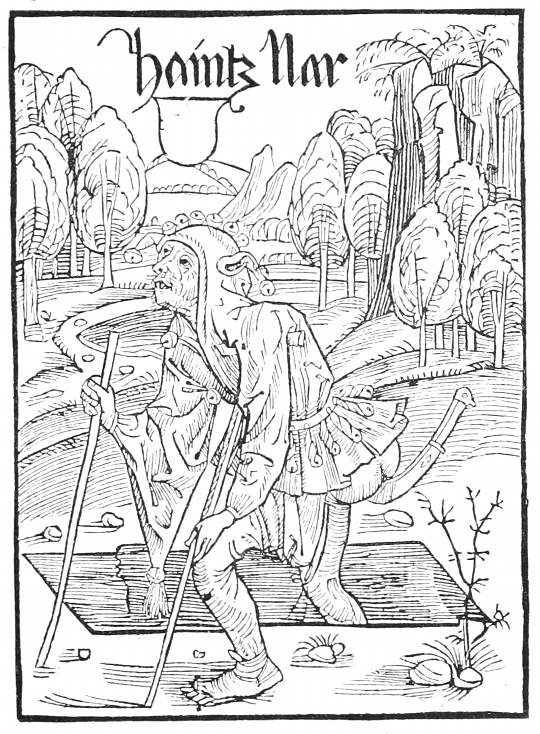 Dürer’s later productions of such high caliber, innovation, and audacity cannot be fully understood without taking into consideration his invaluable journeyman experience in the large publishing companies and his participation in executing extensive illustration cycles such as The Ship of Fools in Basel. Sebastian Brand’s Narrenschiff (1872 edition, with the original 1494 woodcuts). For Alexander Barclay’s 1874 English translation (but with illustrations from the 1497 Latin version) see here and here.